With the Himachal Government giving an undertaking to the Himachal Pradesh Electricity Regulatory Commission that it will pay Rs 30 crore as subsidy to the state power board within a month, there will be no hike in the electricity tariff for domestic consumers. A delegation of the BJP Scheduled Morcha today met the Vice-Chairman of the National Commission for Scheduled Castes and Tribes, Mr C. D. Fakirbhai Vaghela, seeking reservation in the Rajya Sabha and completion of the delimitation work before the next Assembly elections. In order to save locals and thousands of tourists who throng the hill station around Christmas from inconvenience, the state police and other security agencies are trying that President A.P.J. Abdul Kalam, during his visit here on December 23, makes the maximum use of a chopper for local use rather than travelling by road. Mr Rakesh Pal Soharu, a special invitee in the national executive committee of the Bhartiya Janta Yuva Morcha, has accused the UPA government at the Centre and the Congress government in the state of adopting anti-youth posture. The proposed airstrip in Mandi district has been caught up in a fresh row over the selection of site, though Airport Authority of India is yet to finalise it. The local Municipal Council has put up a unique scheme on “solid-based management for disposal of garbage” with an outlay of about Rs 1 crore. The scheme has been submitted to the Central Government for approval. Taking serious note of the negligent attitude of the state administration and the jail officials towards the conditions prevailing in jails, the HP High Court has directed the state Chief Secretary to constitute a committee headed by the Secretary (Home) to suggest necessary remedial measures. Chief Minister, Virbhadra Singh has asked the Sports Department to explore the possibility of setting up an all-weather ice skating rink here. Reviewing the functioning of the department at a meeting here today, he said the existing natural ice skating rink was operational only during winter. Chief Minister Virbhadra Singh said today that a complete survey of all the trekking routes in Himachal must be undertaken so that route maps with complete details can be prepared so as to guide the tourists better. 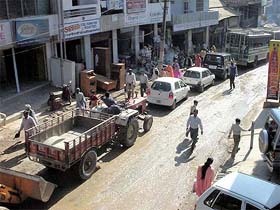 Due to the ever increasing vehicular traffic and frequent traffic jams in the congested markets of the town, the District Magistrate, Kangra, had issued a notification to enforce one way traffic in January, 2002. Tributes were paid to the martyrs of the 1971 Indo-Pak war at the War Memorial here today by organising a function to observe Vijay Divas. Personnel of the police force participated in the programme. A hike in charges seemed imminent after the government expressed its inability to open a letter of credit in favour of the board to facilitate the payment of subsidy of Rs 3.26 crore on a monthly basis. The commission had earlier passed an order directing the board to charge the unsubsidised tariff approved by it if the government failed to open a letter of credit. The government had been maintaining that there was no need to open a letter of credit as a higher amount was due from the board to it. However, the board also made a similar claim. The commission in view of the undertaking given by the government provided relief to it by acceding to its request for not insisting on opening a letter of credit in favour of the board. However, it also directed that the board would pay any amount to the government as long as the accounts of the two were reconciled and payables and receivables settled. The board has been claiming that the dues on account of non-payment of subsidy by the government and bills came to Rs 169.18 crore. On the other hand, the payables to the government on account of electricity duty, free power and other charges amounted to only Rs 61.81 crore. The commission took care of the subsidy part to ensure that the tariff order passed by it on July 5,2004 was implemented in letter and in spirit. The total amount payable to the board up to September 2004, including Rs 22 crore on account of the illegal rollback of tariff by the previous Dhumal government, came to Rs 39.04 crore against which only Rs 9 crore was released by the government. In another significant development, the board has filed application for the determination of tariff for the year 2005-06 before the commission. Earlier, it had sought time from the commission for it. The commission had made it clear that there was no provision for granting extension for filing the application. The Himachal Pradesh State Electricity Regulatory Commission yesterday issued notices to the Bhakra Beas Management Board (BBMB), the National Hydroelectric Power Corporation (NHPC) and the Sutlej Jal Vidyut Nigam (SJVN) for distributing power without licence. These public sector undertakings have been purchasing power from the state electricity board and supplying to its colonies in contravention of the Electricity Act, 2003. Section 12 of the Act makes it mandatory for public utilities to obtain a licence for distribution of power. The BBMB is supplying power to its colonies in Sundernagar and Slapper, the NHPC in Kheri and Banikhet and the SJVN in Jhakri and Jeori. The delegation headed by BJP leader Virender Kashyap met Mr Vaghela here and handed over a memorandum, listing various demands and issues concerning the SC and ST. They demanded that the Delimitation Commission should be directed to complete its work before the next assembly elections in March, 2008, so that on the basis of population the number of seats reserved for them could go up from the present 16. They also demanded that at present there was no reservation for the SC in the Rajya Sabha and efforts should be made to get representation for them in the Upper House. “Though a number of legislations have been made for the uplift of the SC, due to lapses in the implementation there are examples of discrimination against them like ban on their entry in some temples and at certain places they also barred from drawing water from water tank or well,” Mr Kashyap pointed out. The delegation sought the intervention of the commission to ensure reservation in jobs being given on contract system in the state and also in the private concerns, where there was the maximum employment opportunity. They brought to the notice of the commission that promotion roaster was not being implemented in government service which had led to a lot of resentment amongst the employees belonging to the SC. The other delegation members included former ministers, Mr I.D. Dhiman, Mr Roop das Kashyap, Mr Tilak Raj, Mr Harnam Singh, Mr Brij Lal, Mr Roshan Lal and Mr Sukh Ram. The President will land at the Kalyani helipad which is right next to the Retreat, where he will stay on December 22. It is on the next day that he is expected to attend a function at Himachal Pradesh University (HPU). It is being recommended that he should go in a chopper from Kalyani airport to Annadale. “This will save the tourists and locals from inconvenience as we will not have close down roads for public use as he will not touch major part of the town and can cover the small stretch from Annadale to HPU and the Legislative Assembly by car,” informed a police official. It is on December 23 that President Kalam is scheduled to address the legislators of the Assembly. Police officials pointed out that though the first priority would be to make the President travel in a chopper within the town, in case of bad weather the option of travel by road has to be kept open. The large number of garrages and workshops along the road in Dhalli and Sanjauli have been asked to remain closed after December 21. The state police is making elaborate security arrangements as reserve forces from the battalions are being deployed. The task of the security agencies becomes all the more stupendous as the town sees the maximum rush of tourists in the last week of December to celebrate Christmas and New Year. As part of the security arrangements, the police will check all hotels and vehicles entering the town after December 21 as a precautionary measure. Mr Rakesh Pal Soharu, a special invitee in the national executive committee of the Bhartiya Janta Yuva Morcha, has accused the UPA government at the Centre and the Congress government in the state of adopting anti-youth posture. Both these governments were not sincere towards the people. Talking with reporters here last night, he said that the BJYM was committed to helping the youth and would adopt a tough posture all over India regarding the problems and difficulties being faced by them. He alleged that while the previous NDA government led by Mr Atal Bihari Vajpayee had created 80 lakh jobs in India, the UPA government had abolished all those schemes under which these jobs had been created. It was a sheer injustice with the Indian youth. Mr Soharu blasted the state government for signing of MoU with the Central Government on fiscal reforms and dubbed the same as anti-people. He said that nearly 1,000 activists of the BJYM would stage a dharna in front of the state Assembly against the MoU in the Budget session of the Vidhan Sabha next year. Similarly, the morcha would also take out a procession at Hamirpur on December 20. The team comprising officials from the district administration and the Airport Authority of India (AAI) today surveyed the two sites at Mahadev Chambi in Sundernagar and the Dhanghu near Ner Chowk in Mandi Sadar. The series of surveys have been going on for a decade as the team had already surveyed nearly half a dozensites in the district, including one each at Rairhdhar, Nagnidhar and one near Paddar in the Drang constituency, but the authorities are yet to finalise the site. The Deputy Commissioner, Mandi, Mr Ali Raza Rizvi, said Dangu site in Mandi Sadar among three others in the valley have been shortlisted for the purpose. “They would submit the report to the ministry for approval. There is no dispute over the site as the whole area is contiguous land”, he added. Mr Rizvi said fog is not much of problem. “The airstrip would require more than 15,000 bighas of land for the purpose. But it all depends which site is selected”. The sources disclosed that the airstrip project was initiated by the then Defence Minister, Mr Sukh Ram, and he had surveyed sites near Paddar in the Drang tehsil. The then BJP MLA from Balh, late Piru Ram, had proposed to set up the airstrip at Balh, but residents of Sundernagar while pleading their case said Balh remained foggy most of the times, blurring visibility and that could hinder the landing and taking off of aircraft, besides posing hazard to the passengers and the residents. The sources said the airstrip in Sundernagar would shoot up the cost of the project by several crore as the airport authorities would have to pay compensation to the farmers as it involved over 2,000 bighas of prime cultivable land in Sundernagar for the project. Giving this information here today, Mr S.P. Dhall, President of the Municipal Council, said that the scheme was in the pipeline and expected to be cleared soon. He said that it was specially designed for the upkeep and beautification of the historic town of Chamba. Likewise, another exceptional scheme costing Rs 1 crore under the Integrated Development of Small and Medium Towns (IDSMT) had also been prepared and sent to the Central Government for sanction, which was also likely to be cleared in the near future, said Mr Dhall. He said that this scheme was a joint venture of the state government and the Municipal Council and envisaged the construction of a shopping complex, development of parking lots and landscaping of the western slopes of the legendary Chowgan in the hill town. Besides, Mr Dhall said that Rs 26 lakh had been earmarked for various development activities in the town. Mr Dhall informed that during the current fiscal year the local Municipal Council had decided to generate an income of nearly Rs 1.44 crore from various sources, including expected government’s grant of Rs 1.05 crore in lieu of octroi. This amount also included fetching revenue from the monthly rent of concrete shops, wooden stalls (khokhas), tehbazari and rest house, besides house tax in the town. The council had also proposed to revise the monthly rent of concrete shops and wooden stalls, which could not be increased for a long time, as the business income of traders had increased manifold, Mr Dhall added. Taking serious note of the negligent attitude of the state administration and the jail officials towards the conditions prevailing in jails, the HP High Court has directed the state Chief Secretary to constitute a committee headed by the Secretary (Home) to suggest necessary remedial measures. He has been directed to file the report before April 1, 2005. Mr Justice K.C. Sood passed this order during the hearing of a bail application moved by Tara Chand, an employee of Una sub-jail, who was allegedly involved in helping an accused in committing a murder on the premises of the sub-jail, Una. Earlier the court had summoned the Additional Director-General of Police (Prisons) in court to explain about the deteriorating condition of the Una sub-jail and directed him to initiate a high-level inquiry into the incident, which took place on August 24, 2004 in which a person, who had entered the jail without signing the jail visitors register, was murdered inside the jail and his body was smuggled out during the night. In compliance with the directions of the court, the inquiry was entrusted by the Additional Director General of Police (Prisons) to the Additional SP who had submitted his report before the court. After perusal of the inquiry report, the court observed that it was a matter of great concern and anguish that no administrative and departmental action was initiated against any of the jail officials after the murder took place. Keeping in view the gravity of the situation the court directed the Chief Secretary to transfer the entire staff posted at the Una sub-jail. Chief Minister, Virbhadra Singh has asked the Sports Department to explore the possibility of setting up an all-weather ice skating rink here. Reviewing the functioning of the department at a meeting here today, he said the existing natural ice skating rink was operational only during winter. With the construction of an all-weather ice skating rink, tourists and local persons would be able enjoy the sport round the year. He said experts should be consulted for designing the rink which should conform to international standards. Referring to emerging techniques in sports all over the world, he said coaches of the department should keep abreast of the latest developments in their respective fields so that they could prepare youth for competing at national and international levels. Infrastructure being created for boosting sports activities at the village level also needed to be standardised. Mr Virbhadra Singh said this while presiding over the second Annual General House meeting of the Manali based Western Himalayan Mountaineering and Adventure Sports Institute here today. “The institute must prepare complete details of the routes with distances, wayside amenities and climatic conditions for the convenience of the trekkers,” he said. Due to the ever increasing vehicular traffic and frequent traffic jams in the congested markets of the town, the District Magistrate, Kangra, had issued a notification to enforce one way traffic in January, 2002. But it has failed badly thanks to the apathy of the police and local administration which did not take any step to enforce the rule. The one way traffic rule had allegedly flopped due to the indifferent attitude of the police as no traffic policeman had been deputed to check violation of the rule. As a result, the markets in the town had started witnessing traffic chaos and jams. The chief guest on the occasion, former Tourism Minister Major Vijai Singh Mankotia said that it was on this day in 1971 that the Pakistani forces suffered defeat at the hands of the India Army. Artistes of the Public Relations Departments and students from local schools sang patriotic songs. The skelton of a man aged about 30 to 35 years was found near Kangoo village in the district today. The police took it into its custody. The skelton must be four to five months old, according to Mr Yashbir Pathania, ASP, Hamirpur. Mr Pathania said that the skelton was first noticed by a group of women who had gone to the area for collecting firewood. They became panicky and informed the local gram panchayat pradhan who, in turn, reported the matter to the Nadaun police. The annual examination of Class XII of the Himachal Pradesh Board of School Education will begin on March 5, 2005. A spokesman of the board said that the date sheet for the examination had been notified.